POLISH POTTERY | POLISH STONEWARE Polish Stoneware Oval Casserole dish with lid is an exceptional piece of Polish pottery from skilled artisans of Boleslawiec, Poland. This casserole dish is safe to put in the oven, microwave, dishwasher for outstanding baking results with elegant style. 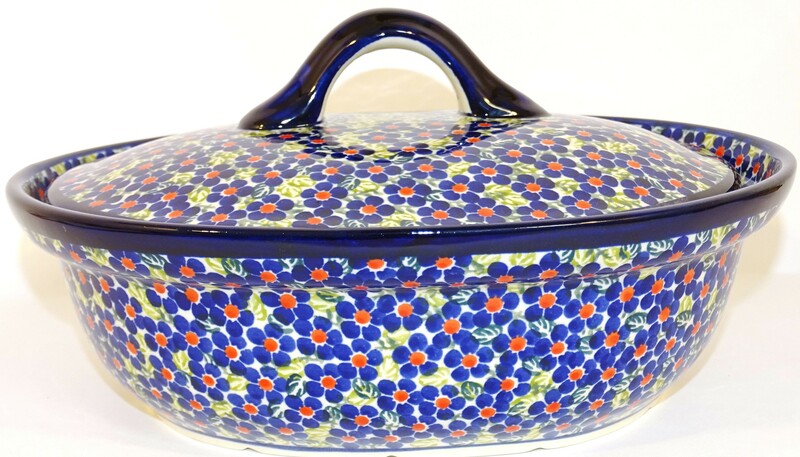 Pottery Avenue’s, Covered Casserole Dish will make a wonderful addition to your Polish pottery collection or a great, first piece. This exceptional Polish stoneware is ideal for baking or serving and stunning kitchen decor. Imagine your stew, roast or casseroles baked in this beautifully hand painted dish. The high-quality clay from Boleslawiec, Poland makes this handcrafted stoneware oven, dishwasher, freezer, and microwave safe. The patented formula glaze gives it shine and luster while providing a smooth, naturally non-stick surface for easy cleaning. Designed in an elegant oval shape, this casserole dish comes with a top handled lid for added convenience. Contact your Pottery Avenue personal shopper for more information. A national treasure, Boleslawiec ceramics have been manufactured for centuries. Developed from natural ceramic clay that can be found near Boleslawiec at the Bobr and Kwisa rivers. According to historical sources, the first stoneware was made in medieval times and in the early 16th century, local potters formed guilds to ensure perfection. Zaklady Ceramiczne "BOLESLAWIEC" was founded by one of the original men with the first pattern dating back to 1759. “Friendship, Covered Casserole“ is an Artisan pattern based of the 300 year old pattern "EYE OF THE PEACOCK". Designed by top designers and imported by Pottery Avenue, the premier importer of Polish Pottery & Polish Stoneware.